The existence of a compliant media plays a major role in allowing American presidents to create so much violence and chaos around the globe. Far from being a check on officialdom, the press are part and parcel of the machine which crushes so many lives in this country and abroad. Long gone are the days of the Pentagon Papers, when media outlets competed with one another to break stories which officialdom wanted to keep hidden. Now the press lords work hand in hand with politicians to make certain that they have carte blanche whenever they want it. President Obama has decided to send weapons to the coalition represented by jihadists, Gulf monarchists and regime opponents working to overthrow Syria’s president Bashar al-Assad. The administration again makes the same claims which always explain away American aggression. A foreign head of state is accused of terrorizing his citizens, spreading said terror to other lands and bringing down modern civilization. We are then told that the foreign leader must be deposed from power for the sake of humanity. The country may be Libya or now Syria but the explanation is the same and so is the media modus operandi. The press merely repeat what the president says and call it journalism. The public are left in the dark and in the absence of real reporting are forced to read tea leaves to figure out what is really happening. If Obama and his NATO cohorts are all bellowing loudly that “Assad must go” they think they have him on the verge of defeat. If they propose a peace conference they have acknowledged that Assad’s forces are winning. If they give mixed messages about a peace conference and then claim Assad is using chemical weapons and also announce they are arming the rebels they are in full panic mode because their plans for easy conquest have gone awry. The Obama administration, and any other presidential administration, ought to be afraid to tell such lies to the public. They should fear that their claims will be thoroughly examined and all facts will be exposed. But like his predecessor George W. Bush, Obama has no reason to feel any such discomfort. A quick perusal of the major corporate media will show that the very premise of American intervention in Syria or anywhere else is accepted without question. Even worse, America’s role in fomenting war is rarely pointed out. There would be no carnage in Syria absent the machinations of the U.S. and its NATO allies. There are Syrians who want changes in their government, but their wishes alone wouldn’t bring about a civil war. Anyone aware of this important point certainly hasn’t relied upon the major broadcasters or newspapers for information. The average American believes that the intervention is humanitarian in nature because the government and the corporate media have told them so. News talk shows debate whether the United States should choose sides without mentioning that the entire conflagration is the result of American plans to remake the region into a huge vassal state. “Assad must go” is the mantra but no one on Meet the Press, the Newshour, MSNBC or the New York Times asks why this is so and why an American president has any right to decide the fate of millions of people. Once again Americans are kept in a state of disinformation, unaware that their government is responsible for the deaths of thousands even as it claims humanitarian motives. 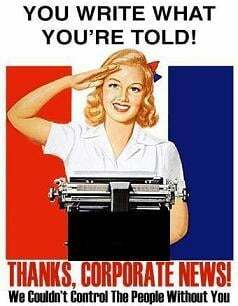 The corporate media obediently recite the administration’s dubious assertions and report them as facts. Administration statements accusing the Syrian government of using sarin gas against the western backed rebels are reported as confirmation. On the other hand, there are quite reliable and easy to find reports showing expert skepticism about the administration’s claims. The media are loyal to the system, not to their profession, their readers, or their listeners. They are cut from the same cloth, and value access to the people whose professional success depends on subservience to the corporations and individuals who also run the political world. We the people, even those of us who want to be aware of current events, learn nothing except politicians’ talking points. The result is that the government has been allowed to embark upon yet another plan to commit crimes against other nations. We are once again complicit and should never again ask why other countries hate us. It is best to assume that presidents and members of congress are lying when they make justifications for waging war. The media must also be added to the liars’ list. They have little interest in giving us easily provable facts when there is favor in need of currying. History will judge not only our political leaders harshly, but every institution which aided and abetted them. The corporate media ought to be placed at the top of that ignominious list.